I have a folder full of images on my local computer that I like to keep synced with a folder on my server. I have tried to use the "keep remote directory up to date" option .. but when I resave a image in that directory it does not upload it... does this feature check the timestamp on the file ? The functionality is available since 3.7.5 only. Thanks... I downloaded the Beta 3.7.5 version and now I get an error that ask to confirm I'm running a sftp server. 3.7.5 has bug in SCP fallback. Please force SCP on Session tab of login dialog. When the file changes, is the file timestamp updated as well? If it is, is it changed to later time? If not, WinSCP can hardly know if the file should be updated. The time change does not reflect in the WINSCP directory unless I hit refresh (even though in windows it does reflect) -- but even when i hit refresh it does nothing. 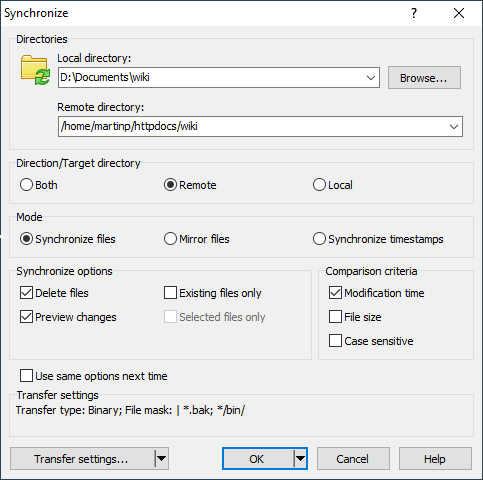 There is a bug (already fixed) in the latest release making WinSCP ignore too often changes in directory. However I do not think that it can be cause of your troubles. However from your answer I'm not sure if the timestamp of the file we talk about ir being updated or not.